Sound familiar? If you like video games, and if you pay attention to what people are saying about it, chances are you’ve already heard these statements before, whether from your friends of from the media. Jean-Christophe Cambadélis, one of the leaders of the French socialist party, recently triggered a small controversy by stating that video games were about “shooting down as many people as possible in a short amount of time”. Video games are always one of the greatest excuses to account for the violence of our society. You know, as if the world had been a place of eternal peace and infinite joy before video games came to be. My name is Nicolas. Everything’s fine in my life, I’m mentally stable and happy, I love my family and cute animals. Why am I saying that? Well first, because this is my first post on this blog, and that I feel the need to introduce myself. But also because I want to prove that I am as far as you can imagine from the psychopath type (well, of course, I might be lying – besides, how do you recognise a psychopath, anyway?). I’ve got loads of qualities (which I won’t mention – they are far too numerous, right?). Yet something had to be wrong about me. I love video games. “O, Tragedy! O, Disappointment! He seemed like such a nice boy! Such a shame he loves video games…” Let me reassure you, no one’s ever told me that. I will not pretend that gamers are victims here. There are far too many disciminations in our lives, there’s no need for me to make up new ones. No one I know has ever been ostracized or discriminated against because he/she loved video games. Yet, there’s no denying that video games tend to have a bad reputation in our society. Most people associate games with the idea of addiction, and there’s still this strong consensus that gamers are sociopaths in their fourties, who prefer games over romance. It is also true that people are often being judgmental when I claim that I love video games. There is this cliché that says that all gamers are just kids who refuse to grow up and live in the real world – that they are stuck in some variation of the Peter Pan Syndrome. I’m often considered as childish just because I love video games. What bothers me is that most people who think have never played a single video game in their life. Ignorance is what leads to stereotypes. They have seen their kid play Pokémon (“Damn, what a childish game!”) and Call of Duty (“A game about war! How awful!”), then they claim that video games are stupid and violent. How very wrong they are. For this reason, one of the long-term goals in this insignificant life of mine is to reestablish the truth, to shut down the clichés and to prove to video games haters that gaming is much more than that. (I know, it would sound better if my long-term goal in life was world peace but hey, one fight at a time). As far as I am concerned, I even believe that video games can be considered as a form of Art. But this is something that usually sounds sacrilegious for the guardians of Art and Culture, so I usually don’t shout it from the rooftops. One of these guardians turns out to be a Philosophy teacher,. He likes to push the stereotypes about violence in games even further (I think it’s pretty ironic to be prejudiced against something when you’re supposed to be an open-minded philosopher, by the way). According to him, ALL gamers are potential jihadists, and ALL video games are meant to turn people into terrorists. What. The. Bloody. Hell. Well, I will tell you something. Surprising as it may seem, I’m not so much interested in terrorism and mass murder, even though I have been a gamer ever since the age of 5. And if you agree to read the article of the potential jihadist that I am, you might understand why. My teacher’s argument is that the Islamic State’s propaganda is aiming at the younger people – more particularly, young people who play video games. I must admit that he is right about that. Lately, ISIS has been conducting communication campaigns aiming at the western audience – an audience that is fond of blockbusters, visual effects and video games. 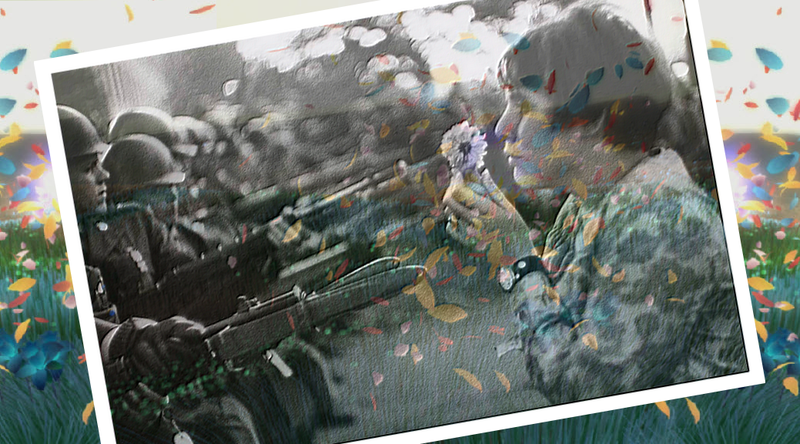 They create short films that borrow Hollywood’s visual codes, in order to make their terrorist actions look beautiful. Yes, it is true that ISIS wants to make reality look like a video game. But game developers never wanted video games to portray reality. On the contrary, it is to make their violence look less real, then less shocking, that jihadists get inspiration from video games for their propaganda. Games do not promote violence, on the contrary. Violence in video games rarely goes unpunished. In games like Deus Ex, players are encouraged to knock their enemies unconscious instead of killing them. If the player chooses to keep acting like an assassin, the game will be much harder and the protagonist’s boss will even blame him for that. In many games, killing civilians may result in a penalty for the player (bad reputation, unreachable quests…). Other games (a lot more than some people might think, actually) simply aren’t violent at all. Contrary to popular belief, blood and combat are not an essential feature of video games. In platformers, for instance, combat is far from being violent. It generally takes nothing more than jumping on your enemy’s head or punching him in the face to make him disappear without any other “gore” visual effect. Sometimes there are no enemies. Sometimes there are no guns. Sometimes there is no violence. So don’t bother arguing that video games are nothing but violence: this simply isn’t true. Below is the trailer for the game Flower, in which the protagonist is… A flower petal. A game so violent it will turn you into a terrorist, for sure! Even when violence and murder seem to be gratuitous, such as in Grand Theft Auto, or more recently in Bloodborne, they’re both so overly exaggerated that they lack all kind of realism. The goal is instead one of aesthetic research. In GTA, violence is deliberately pushed very far, only because it contributes to the depiction of a caricature of the United States, which is what GTA aims at doing in the first place. In Bloodborne, blood is spilling from everywhere, which can be shocking for some people, but that is not a reflection of reality, nor is it a promotion of real-life violence. Just like a Tarentino movie, these games are not meant to promote violence, no matter how much blood is seen on screen. Some movies, like some games, try to find a form of beauty in violence by over-exaggerating it – though I understand that not everyone is receptive to that. The audience just needs to be able to take some distance between reality and fiction. And you cannot expect your 7-year-old child to be able to make such a distinction by himself. Please, just don’t let him play GTA, he’s not old enough for that. Some kids do become violent because of video games, but is it because of the games per se or because they’ve been exposed to games that weren’t appropriate for their age? It is the lack of dialogue or education that is to blame, not video games. All gamers are not potential jihadists. Just because I am virtually killing people does not mean that I’m a repressed murderer. Most players are educated and civil, and they are able to remember that games are just that games, not reality. As of today, no one has been able to prove that there actually is a link between violence in virtual life and violence in real life. I once had the opportunity to read various books about the media and their impact on society. Below is a summary of French sociologist Patrick Legros’s article called “Violence in media and aggressive behavior”. He explains that fear of the media is actually quite common. In the 19th century, serials were published in the French press. These short stories were accused of transmitting subversive ideas to French workers. Between WW1 and WW2, radio shows devoted to women were broadcast, and people feared women who listened to these shows would become stupid. The emergence of rock music in the 50s was said to increase juvenile delinquency. Today, cellphones, the Internet and video games are deemed too violent by some people. What this fear of the media actually reveals is the social fear triggered by major social changes. What people were really afraid of was not serials, but syndicalism, which was born at the same time among workers. More than radio broadcasts, what men feared was the emancipation of women. What was actually scary about rock music in the 50s was the emergence of an emancipated, festive and educated youth. Today, in the US for instance, we tend to blame video games, TV and the Internet because they trigger violence… But what about other causes, such as the weak economy of some neighbourhoods, or the lack of public security, or the selling of weapons? Contrarily to the US, Japan is the country in which the rate of rapes and murders is the lowest in the world… Even though Japanese people are fond of combat games and sexually explicit manga books. Why? Because the Japanese culture revolves around a collective spirit and the fact of living altogether. Japanese people are taught at a very young age not to disturb, harm or judge others, but to respect them instead. On the other hand, violence is part of the United States’ culture and history. The media (in our case, video games) have to be considered as part of a whole society, with its own culture and its own means of reception. Is there a link between media violence and real-life violence, then? Several hypotheses have been formulated – but none of them was proved right or wrong. Aristotle thought that fictional violence was a way for us to heal (catharsis). Theatre (and particularly tragedy), for instance, is a way for the audience to evacuate their negative feelings and emotions. Witnessing violent scenes would actually allow us to evacuate our own frustrations without being violent ourselves – some kind of self-censure, in a way. Works of art or simple goods? In order to get rid of all the clichés regarding video games, I’d like to come back to thoughts of my Philosophy teacher, self-proclaimed judge of what belongs to the “noble culture” (thus worthy of our attention), and what belongs to the awful and degrading subculture of the uneducated (how very open-minded of him). According to him, those who develop video games only have one goal, which is to make the player as stupid as possible, by all means. Game developers, as well as Hollywood filmmakers, are working conjunctly to kill off our brain cells. They even place electrodes on people’s heads during test-screenings in order to ensure that their encephalogram is flat enough. And if it’s not flat enough, they add some explosions here and there (I’m still quoting my teacher here). The ultimate goal of this machination, of course, is to sell us bottles of Coca-Cola. Because that’s all filmmakers and game developers want to do, right? 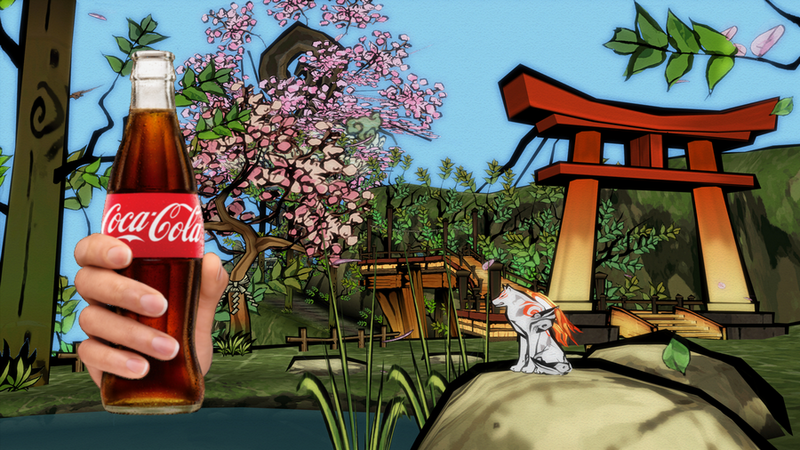 Here’s a very subtle subliminal image extracted from the game Okami. How greedy can these developers be? Yet, I must once again admit he isn’t completely wrong: video games are goods, video games are meant to be sold, and those who produce video games do want to make money. I’m not denying any of that. I just want to make it clear that those who create video games and those who sell them are two completely different entities. Similarly, movie directors are not producers, book writers are not publishers, and musicians are not label executives. We live in a world where works of art have become goods that you can buy. Do they cease to be works of art because of that? I don’t think so. And I don’t believe that video games are created for the sole purpose of taking money out of the consumer’s wallet either. Of the publisher of the game (the one who sells) has some sort of influence over its development. Yet, the priority of the developer (the one who creates) remains in most cases to create something, with the right balance between beauty and fun. And the more developers manage to distance themselves from the publisher’s restrictions, the more obvious this desire becomes. Indie games, that are created without a publisher’s constraints, are most often valuable and amazing games made with a true artistic quality and with passion, and that can move the player a lot. Yes, video games are meant to be sold. But I do believe that they’re meant to be more than just that. Aren’t they works of art? I know that is a tricky question, especially because it’s not that easy defining what art actually is. I could look it up in the dictionary or on Wikipedia, or even ask an artist to tell me what art is all about, but all I would obtain would be three radically different definitions. I think there is no clearly established definition of Art. I know some people will refuse to admit that video games might be a form of art, because art is supposed to be the work of one person. Other people will say that art is not meant to be sold. I hear all that. And I don’t mean to force anyone to agree with my vision. So let me put things differently: can’t we find an artistic dimension in video games? The way I see it, a work of art is above all one particular way of expressing the universal humanity that binds us all. A work of art, a true work of art, has the power to move absolutely everyone, to transcend everyone with its beauty, for genius is something that touches our very humanity. What I think makes a work of art valuable is the richness of its meaning. For instance, I had to read Shakespeare’s Othello in English class this year. At first, I simply didn’t feel anything, nor did I realize how meaningful it was. Then, I started studying it in class with my teacher (I should really consider dedicating this post to my teachers, they seem to be so much of an inspiration to me!). That’s when Shakespeare’s genius finally struck me. Analyzing just a few lines of the text made so many interpretations emerge that it actually got confusing. The best works of literature are those that you can always analyze and interpret, those that seem to be forever meaningful, no matter how many times you them. That’s also the case for a painting in a museum – you can judge its quality based upon the emotions it conveys. That’s what I mean by “the universal humanity” contained within “one particular” work of art. And some games did make me feel that way. Not every game. But some of them. That’s also true for other arts. Cheesy airport novels are nothing compared to Baudelaire’s Fleurs du Mal, Hollywood blockbuster cannot compete with cinematographic masterpieces, awful daubs look terrible next to master paintings – in the same way, one must distinguish a video game that was rushed in order to be sold as fast as possible, from the wonderful game that came from the developers’ hearts. I think one of the best examples of this type of games is Silent Hill 2. In this survival-horror game, the protagonist, James Sunderland, receives a letter from his deceased wife, prompting him to come back to Silent Hill, the town where they had spent romantic holidays years before. Distressed and upset by his wife’s death, James clings to the glimpse of hope that this letter represents. However, the town of Silent Hill will soon plunge him into different nightmarish dimensions, each of them corresponding to several levels of his own mind. I won’t get into every detail of Silent Hill 2 – not in this article, at least. But what I wanted to say was that nothing is left to chance in that game. Each monster, each setting, each character actually reveals James’ own backstory and personality. Interpretations of James’ journey are multiple, if not infinite. As for the beauty of this love story between a man and his deceased wife, I believe it can easily compete with some of the best tragedies of literature or cinema. Silent Hill 2 is the perfect example of what really is a good video game: a solid narration, a lot of emotions (from fear to tears), a brilliant artistic direction and an amazing soundtrack (including Theme of Laura (Reprise), composed by Akira Yamaoka, see below). You are free to disagree with the idea that video games could be an art in itself, but you have to admit that it’s at least a combination of several arts: graphic arts, music, writing, etc. Engines such as the UbiArt Framework now allow developers to incorporate “hand-drawn” images (actually drawn on tablets) directly into their games. Graphic designers are true artists. And what about the musicians who compose the soundtracks? What about the writers who shape complex intrigues and detailed universes? What about the actors who share their voice and (more and more often) their likeness with game characters? And what about the work of game programmers (as well as other jobs that we tend to forget), who are able to build a whole game from scratch? They’re all artists, too. And they deserve credit for the time and energy they spend on creating something beautiful. They deserve credit for having mastered particular tools or knowledge in order to give birth to a video game. I believe that acquiring a particular savoir-faire and putting it into practice means being an artist, somehow. 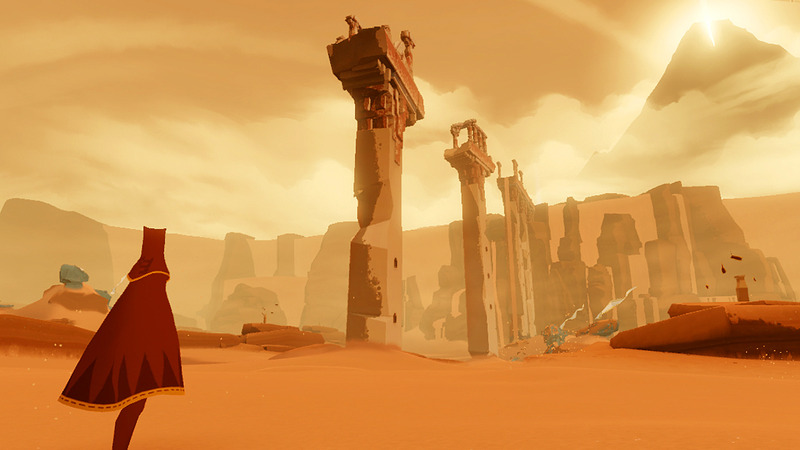 Journey: a non-violent (yes!) adventure through a wonderfully-designed environment. Games can also be considered as the door towards knowledge, or towards other forms of art. As far as I am concerned, I have to thank Tomb Raider for making me love ancient cultures and mythology. Had I never played Tomb Raider, I probably wouldn’t have studied Latin. There is an excellent blog called The Archaeology of Tomb Raider that does an equally excellent job of analyzing works of art, monuments and places featured in the Tomb Raider games, while also providing cultural knowledge at the same time. Actually, games like the Assassin’s Creed series or Valiant Hearts have their own in-game encyclopedia. Never Alone is a game that tells an actual legend from the Inuit folklore. In-game sequences are followed by short documentaries about the Inuit way of life. A great way to discover another culture, and a nice way to learn while playing. Just like Kelly M (the woman who runs The Archaeology of Tomb Raider) says: games can be educational. You can blind yourself and pretend that all video games are as dumb as the short Candy Crush sessions that you play on your smartphone in your dentist’s waiting room. Or, you can admit that most games are made with passion and humanity. I believe art and culture are what truly makes us human. It actually is what separates us from the jihadists my Philosophy teacher wants to compare gamers to. While they destroy museums, we fight for our liberty of speech. Surprisingly enough, I haven’t paid a lot of attention to what my Philosophy teacher had to teach me this year. Yet there’s one thing I have remembered, and that’s the ancient Greek distinction between poiesis and praxis. Poiesis is the concept of usefulness, of what aims at a particular purpose, while praxis means what is useless, things that are not made with a particular goal in mind, but that are made just for the sake of it. Art is useless. Art is made just for the sake of art. There’s no other purpose. Art is praxis. And praxis is, according to Aristotle, what makes us absolutely human. Well, that’s a little more complicated than that, actually, but that’s all I can remember from my Philosophy lessons. It is your right to believe that video games are only created to provide fun. I believe that video games are useless – as in praxis useless, I mean. You can enjoy games just like you can enjoy literature, cinema, music, etc. Just for the sake of art, to contemplate what Humanity is all about. There are people who play videogames just for fun, and that’s fine. Then there are people who enjoy the artistic dimension of videogames, and that’s fine too. And I actually know more people who belong in the second category. And that’s the end of this long post. I just wanted to get rid of some clichés while defending my own vision of video games as works of art, or at least as parts of our culture and humanity. I don’t force anyone to share my opinion, but I hope I have made you think about the subject, and I am willing to hear your reactions on the matter. As for me, I will continue to share my vision about video games on this blog. What do we have to learn from games? How are they shaping our culture? Are they really a form of art? We’ll see. I’m an “artcore gamer”, I’m seeking art in video games, and I’m trying to analyze and interpret games in the same way some people analyze movies, books or paintings. I hope you’ll join me in my “long-term lifegoal” of changing people’s opinion on videogames. And then we’ll see what we can do about world peace.